What do Internet of Things and Industrial Internet mean? The Internet of Things and Industrial Internet are generating a lot of buzz nowadays. Almost everything is marketed as a Internet of Things or Industrial Internet solution or somehow connected to without really describing exactly how. I wrote earlier in Arch Red's blog What Internet means for service providers, but in this Radiator Cookbook I will focus more on what is the Radiator AAA server software's relation to the Internet of Things and Industrial Internet and how you can start utilising Radiator as a part of future Internet of Things and Industrial Internet already now. 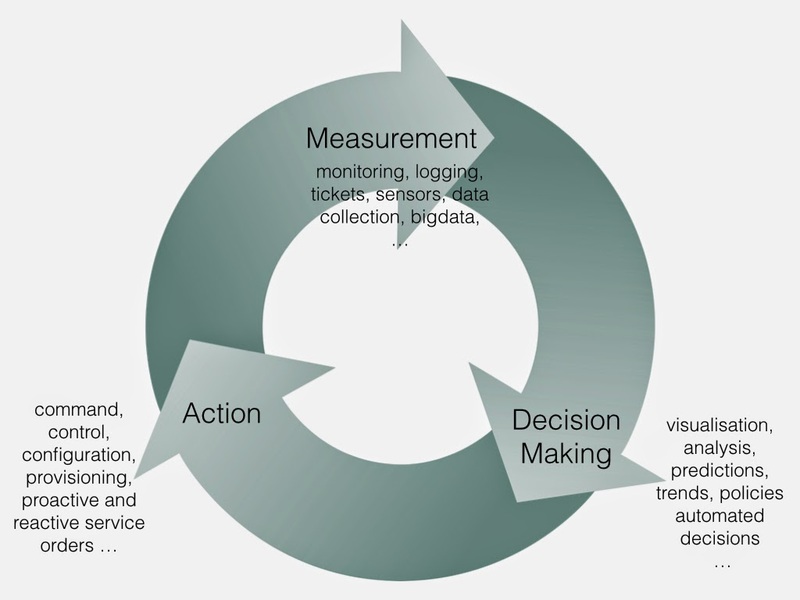 The point of Internet of Things or Industrial Internet can be abstracted like so many other things to the following familiar cycle: Measurement, Decision Making and Action. In Internet of Things or Industrial Internet one objective is to try to monitor and measure everything from physical things to customer satisfaction and collect that data to be utilised in decision making. Decision Making of course relies on data visualisation, analysis, predictions like trends and so on. These decisions can be made manually, but one major point in Internet of Things or Industrial Internet is also automate everything, even decision making in cases where it is possible. Actually if we look at the chart above we can claim that this is not anything new, this is just automation and that is what Internet of Things and Industrial Internet mainly is -- just automation taken further and extended beyond its old borders now that we are able to measure more, store more data, make quicker analysis and decisions, as well as able to actualise the decisions by remote control and provisioning. Radiator AAA server software can be used in every step of the cycle. Radiator can be used to collect more data from network infrastructure components, users, traffic amounts, capacity, sessions etc. In Decision Making Radiator can be used to combine data and policies from several sources to make automated intelligent decisions without having to go through manual process. This can be something like identifying badly behaving end nodes, limiting their resources or quarantining and separating them from other nodes. The data and the policies can be retrieved for example via LDAP, SQL, Diameter interfaces and orders can be communicated to network infrastructure via RADIUS and Diameter automatically. With the help of Radiator AAA server and RADIUS, Diameter and TACACS+ protocols the network infrastructure components can retrieve their updated configurations, policies and security authorisations automatically without having to do manual configuration for each network component separately.